Christmas is one of those times of year where we all feel obliged to roll out our tartan scarves and start wandering through our nearest cities to take dreamy photos of all things festive. 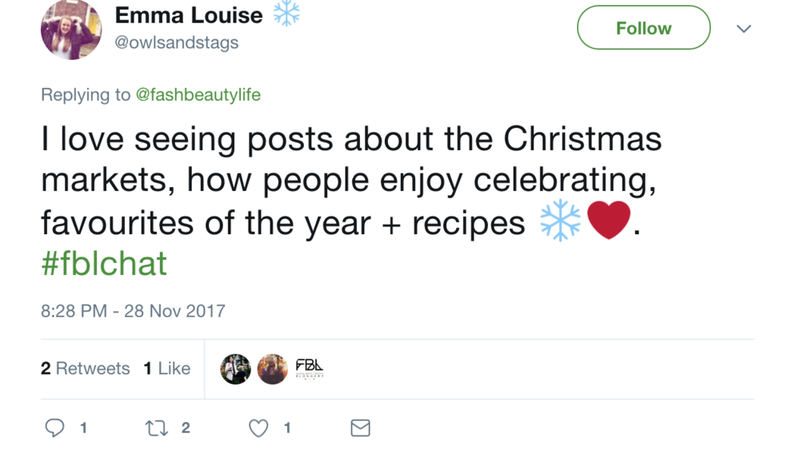 For bloggers, the season does add another layer of expectation where bloggers become obsessed with creating festive content using every tool available to them. This week's post looks at Christmas blogging and what it means to our community. 1) How have you been preparing your blogs for Christmas? So far just researching blogmas ideas. I've made a list of 100 blogmas post ideas for my blog and I've narrowed them down. I've taken the past two days off from blogging so I can focus in mass writing. I have a new header, thanks to @dorkfaceblog! And all my normally black sidebars etc have gone green 🎄🌟 & I have blogmas drafted! Does anything really prepare you for Christmas? So excited about all these new makeup brands and pop ups happening here in London though! 2) Would you ever consider doing blogmas (blogging everyday) in the run up to Christmas? Thus is my second year so I realised where I was weak last year and tried to improve upon it. I've done it before but it was a nightmare i'll do christmas content but nowhere near as much as blogmas needs. I'd be worried I'd just rush to get content out for the sake of it! 3)What are your favourite festive posts to read? I love seeing posts about the Christmas markets, how people enjoy celebrating, favourites of the year + recipes ❄️❤️. It has got to be the Christmas recipes, and family disaster blogs. Everyone has them , so i love reading them! 4) What is the one thing you love most about Christmas? Spending time with my family. This year will be extra special as it’s my sons first Christmas and he will be 5 1/2 months old. He loves the Christmas tree already! We wish everyone a happy festive season and hope everyone has a great time celebrating with their families. Our next #FBLCHAT will be next Tuesday at 8pm. Newer PostNew Year, New Blog.. FBL Chat returns!